What a Beautiful, Beautiful Day! by bus since there aren’t any direct trains. Today, the city of Alba and the surrounding hills of the Langhe are known for their “quality of life” lifestyle. But it wasn’t always like this. Historically speaking, particularly after WWII, the people who inhabited this area endured many hardships and subsequently many of them left this area, known as an agricultural zone, for Turin. They left with the hope of finding a factory job with Fiat and a better way of life. I took a bus from Turin early Friday morning for Alba to participate in a Nebbiolo grape harvest, one of my favorite types of grapes from the region of Piedmont. 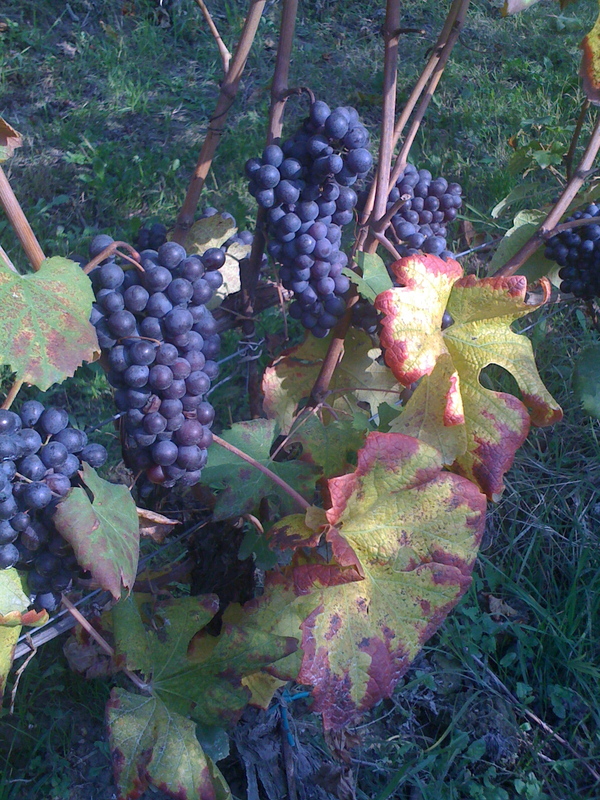 The Nebbiolo grape can be used, for instance, to make Barolo, Barbaresco and Nebbiolo wine. This grape is very sensitive to its environment, much like the Pinot Noir grape. 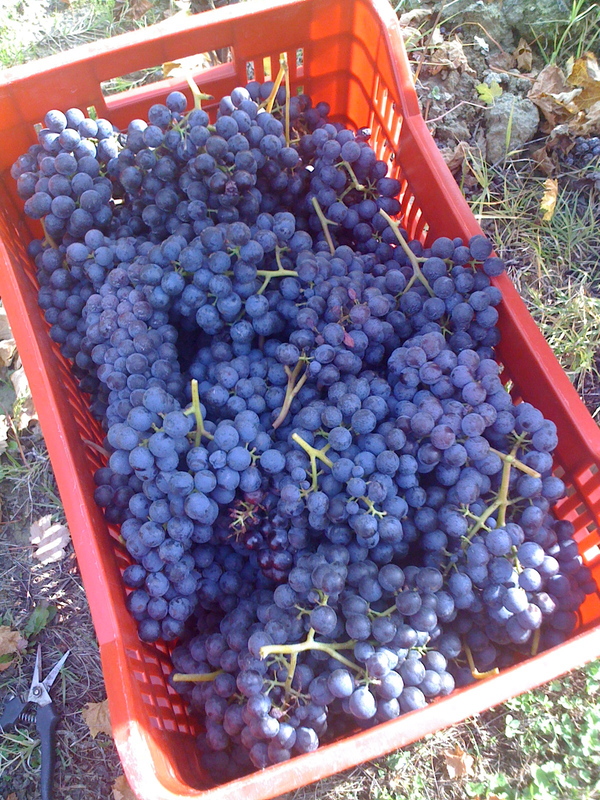 It might seem that the fourth weekend in October would be a little late to harvest Nebbiolo, but the timing was perfect. Growing up in Miami, I didn’t have the opportunity to visit a vineyard or let alone participate in a grape harvest; something I have always wanted to do. I love wine for many reasons. In my opinion, there is nothing better than getting together with family and friends and sharing a good meal together along with a good bottle of wine. However, it’s not just about the final product; that is opening a bottle of wine and discerning all of the flavors and characteristics. For me, it’s also about knowing where the wine comes from. That is, working the land and understanding the process that is typically a year or multiple years in the making. Parusso winery uses ancient wine making techniques with the help of modern-day technology. I was told that we would be harvesting in the zone called Le Coste, also known as la vigna degli americani or the American vineyard because a group of Americans bought and restored the houses that are in this area. There were about a dozen of us picking the grapes. Everything is done by hand and each grappola or grape cluster must be picked delicately so that each grape remains intact and whole. I worked with a group of people from Macedonia…ironically enough the region where wine grapes originate. The workers were very curious about me and wanted to know about my hometown of Miami. After a couple of hours of work it was time for lunch. I had the honor of eating lunch with the vineyard owners. Tinziana’s mother had made lunch for everyone, including Anna who works in their office. We enjoyed freshly made tarajin ai tartufi bianchi (a traditional egg-pasta from Piedmont served with freshly shaved white truffles), carne cruda con tartufi bianchi (raw meat with shaved white truffles), tomato salad with tomatoes that had just been picked right from the garden and for dessert: pere cotte (Piedmont madernassa pears; whole, unpeeled with stems intact), poached in fermented grape must. They were spectacular! When we returned from lunch we began picking from the west side of the vineyard and we were substantially higher up on the hill. Nature was doing its magic in this location. I could see a difference in the foliage, the size of the grapes and the tightness of the clusters. The color contrast between the grapes and the grape leaves are so vivid in my memory. In fact, after I finished harvesting a row of grapes I would casually pluck some leaves off of the vine so I could keep them as a momento. The autumnal colors gave me inspiration and tranquility. The shades of purple in the leaves particularly spoke to me, for they seemed to assimilate the color of red wine. After the harvest, I traveled to the town of Bra to meet my friends Kyra and Roberto for dinner. We all stayed the night in Bra, at our friend Eric’s house, whom is now vacationing in the US. That night I slept so well. I didn’t even hear the roosters crowing early in the morning! I spent the rest of my beautiful weekend with Kyra and Roberto. We went to Alba to attend Fiera del tartufo D’Alba (http://www.fieradeltartufo.org/). All the while, Kyra was trying to find out information about how to grow black truffles in the States but everyone told her that in Italy black truffles aren’t farmed. Later that evening we had dinner at Locanda del centro (http://www.locandadelcentro.it/) located in Castiglione Falletto. We got lost, or rather I got lost getting there…I think my friends began to lose faith in my sense of direction. But in the end, we found the restaurant and shared another memorable meal together. 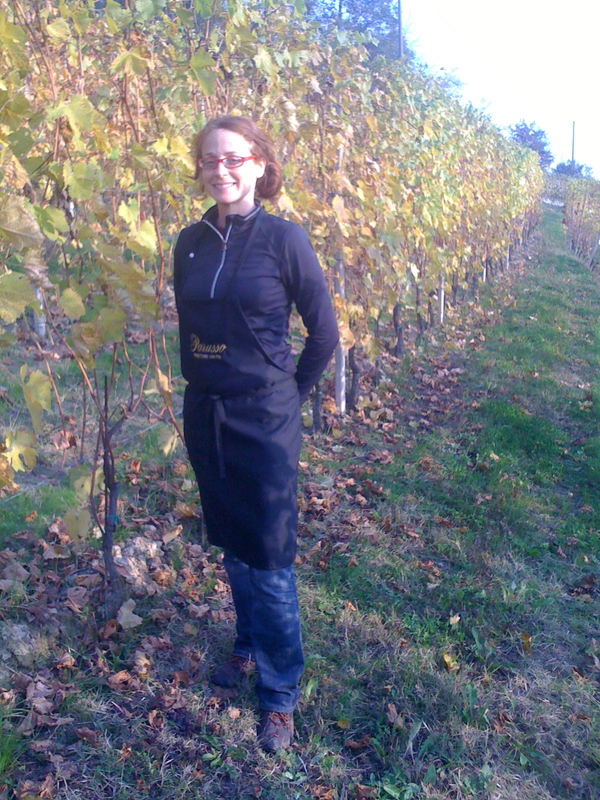 This entry was posted in An American in Turin, Italia, Le Langhe, Nebbiolo Wine Harvest, Piedmont, Torino and tagged An American in Turin, Le Langhe, Nebbiolo grape harvest, Parusso, Piedmont. Bookmark the permalink. Ciao Rachele, welcome on wordpress!!!! I am thrilled that you had such a wonderful experience, and even more so that that you shared it with us!!! We didn’t lose faith in you, we have just revoked your GPS privileges in that area of the country, You didn’t mentioned why the grapes age or rest 5-6 days before processing as opposed to Amarone allows their grapes up to two months. Also, she also does interesting pairing of foods with her wines that I had not considered. Lovely descriptions, wish we were there!